I love a good whodunit. Whether it be romantic suspense, a psychological thriller or a good old fashioned mystery, stories that lure me in, keep me on the edge of my seat and pit my wits against the villain are always high on my reading list. Here are three books that recently kept me up reading way into the night. I highly recommend them! Dr. Caitlin Cassidy is on a mission to protect the innocent. Fifteen years ago, she witnessed her father's execution for a crime she's convinced he didn't commit. Now she works as a forensic psychiatrist to make sure that other innocents don't meet the same fate. Special Agent Atticus Spenser is hell bent on locking the guilty away. A brilliant FBI profiler, Spense loves a good puzzle...especially when the solution takes a psychopath off the streets. But his nemesis, the enigmatically vexing Caity Cassidy, is one puzzle he's never been able to solve. ...one of them is going to die. When a young coed falls prey to a sexually sadistic killer, Caity and Spense are called in by opposing sides. But before the case can go to trial, the accused man is murdered in a brutal attack and Caity is critically wounded. Now Caity and Spense must put aside their differences and work together to uncover the truth - because the Man in the Maze is coming back for round two. 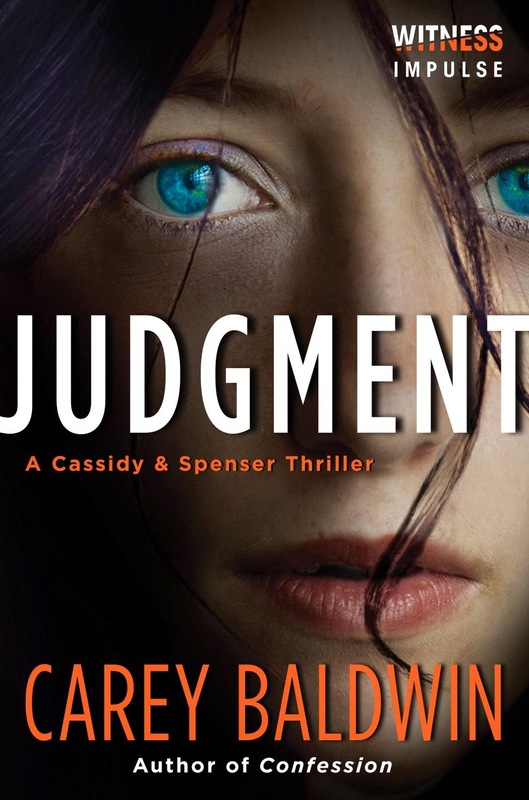 As a former clinical psychologist, Carey Baldwin knows plenty about the dark corners of the human mind, using that knowledge to superb effect in her newest book, Judgment. Once again, she has created a stunning thriller with a tightly woven plot, smart dialogue and twists and turns that keep the reader guessing. While there is no shortage of action, it's the characters who hold center stage in this story: the villains who will chill your soul and have you taking second looks at people you pass on the street and the hero and heroine who will capture your heart with the vulnerabilities hidden beneath the strength and determination they show to the world. If you enjoy a story that challenges you intellectually, takes your emotions on a roller-coaster ride, delivers protagonists you can cheer for and villains that have you double checking the locks on your doors then Carey Baldwin is an author who should be on your radar. The Hunk Next Door kicks off a new series from Black and Webb that centers around The Specialists, a group of agents who give up their lives to take long-term, undercover assignments to protect people whose lives are at risk. After reading this first book (in one afternoon - I could not put it down), all I can say is that I hope this series goes on for a very long time! Protecting her town is Abigail Jensen's sole focus. After busting a major drug trafficking ring, she makes it clear during a television interview that Belclare, Maryland is off-limits to those with criminal intent and, in doing so, unknowingly makes herself the target of a deadly terrorist cell - the power behind the drug ring. There are few people Abby trusts completely. She has to be suspicious if she's to be successful in protecting her town. When handyman Riley O'Brien shows up to help build the town's Christmas village her radar goes on high alert, especially when a series of escalating events aimed to harm the town and discredit Abby begin after his arrival. Is he the bad guy orchestrating the events or the only one she can turn to to keep the citizens of Belclare safe? Black and Webb reeled me in from the start with the premise of this series, the fully developed characters and the small-town charm of Belclare with its quirky citizens, political in-fighting and evil simmering beneath the surface. Unlike many mysteries, in this one, the identity of the villain is revealed early in the book. For me, this ramped the intensity even higher, giving me full access into the villain's thoughts and plans while leaving Abby and Riley on the outside, still trying to figure things out and save the town from an evil adversary as the book races to its stunning conclusion. I'm already counting the days until February 1st and the release of the second book in The Specialists: Heroes Next Door series, Heart of a Hero. After ten years of keeping his distance to the one woman he's always loved, Fire Chief Deke Reynolds is finally ready to set aside his grief and confess his guilt to Elizabeth "Libby" Wilson about his part in her brother's death. Libby's own guilty secret has kept her from sharing her life with the man who stole her heart as a teen and awakened her body as a young woman. Suzanne Ferrell has charmed me with the heartwarming and quirky citizens of Westen, Ohio and put me firmly on their side as they battle those who would bring death and destruction into their midst. Second chance love stories are one of my favorite romance tropes. Deke Reynolds and Libby Wilson have been in love since their teens but a tragic fire tore them apart ten years ago. If anybody deserves a second chance it's these two but just as it appears they may be finding their way back to one another an arsonist enters the picture, determined to keep them apart...forever. Ferrell is adept at combining heartwarming with heartrending, engaging the reader's emotions at every level. She had me laughing, crying and holding my breath with fear. She also kept me guessing. Just when I was sure I knew who the villain was she threw in a twist that had me second guessing my conviction. Characters from previous books in the series play pivotal roles, enriching the story without stealing the spotlight from Libby and Deke. Close to the Fire stands well on its own but with characters from previous books making appearances there are spoilers from those books. You might want to start with the first book and read them in order. They are - in order: Close to Home, Close to the Edge and Close to the Fire. 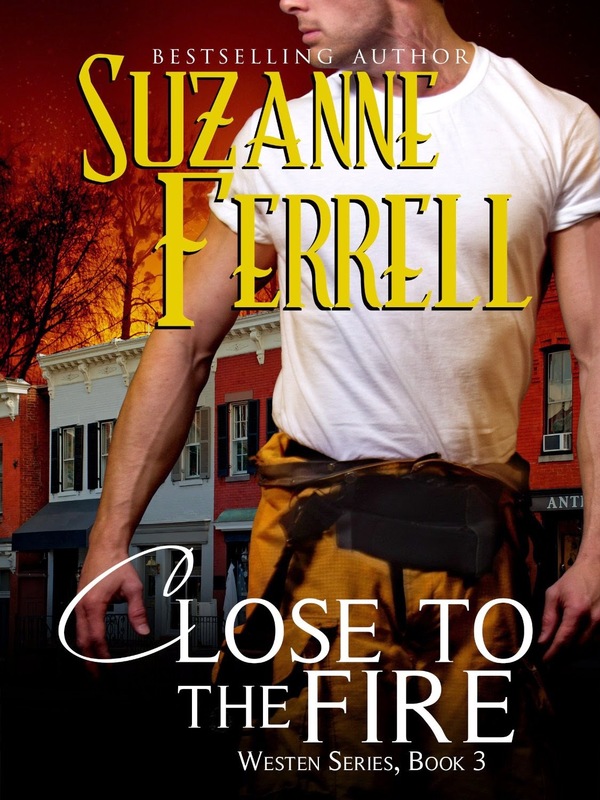 Ferrell also has a newly released Westen novella, Close to Christmas that takes place following the conclusion of Close to the Fire. Are you a romantic suspense/suspense thriller fan? Who are some of your go-to suspense authors? Any recent suspense books you'd recommend? One person leaving a comment will receive a Kindle copy of Close to Home and Judgment. I'm definitely a romantic suspense fan! The way that both authors use their professional knowledge to enhance plot plausibility is impressive. I read Suzanne Ferrel's first Western 'Surrender of Lacy Morgan' which I enjoyed so am looking forward to starting this series soon. Debra Webb & Regan Black are new to me .... thanks for the introduction. I recently 'discovered' Maggie Osborne's books beginning with 'The promise of Jenny Jones' where the heroine saves the hero from hanging by proposing marriage while he is on the scaffold. A curious tradition from the Old West where husbands could be hard to come by apparently! All of her books are electrifying page turners. Also have to mention Mary Jo Putney and her tortured heroes! Hi, Q! I love Carey Baldwin's books too. My favorite is still CONFESSION but I enjoy everything she writes. I'm adding Rachel Grant to my list. Thanks for the recommendation! Debra Webb and Regan Black are both individual bestselling authors who have combined writing efforts on a series of romantic suspense novels. I love the results! You have plenty of great reading ahead with Maggie Osborne and Putney's tortured heroes are among my all-time favorites. Thanks for the great list! I'll have to go check those out :) Ummm.. . My go to for RS has always been Elizabeth Lowell, Nora Roberts, and Lisa Gardner! Three terrific authors! I've been an Elizabeth Lowell fan from way back. I have Judgment and Close to Home. Both great reads! I am a huge romantic suspense fan! Love Dana Marton, Debra Webb, Anne Marie Becker, Kat Martin, Marie Force ( check out her Fatal series), Lena Diaz, Maggie Shayne, Alex Kava, Dani Pettrey, and of course Suzanne Ferrell. Almost forgot! Check out the Bodyguard series from Cate Beauman, Norah Wilson, and Toni Anderson! That's a great list, Debbie! I'm just about to start Kat Martin's next book. She'll be here for a Q&A at the end of January. My nerves can only handle LIGHT suspense. Even then, I often cheat by looking a few pages ahead! LOL!!!! There are times when I feel the same way, Cheryl! Maybe you'll find a new one here to give a try! I love my romance sprinkled with suspense. I'm adding to my list here today. I do enjoy Marie Force for suspense. I do enjoy romantic suspense. There are a lot of good authors who write it but my favorites I have been reading for years like Nora Roberts and Linda Howard. I do enjoy the romance suspense books and read them occasionally. I like Sandra Brown, Linda Howard and Carla Cassidy. If I win the e books, would like them sent to my daughter's kindle. Suspense is basically all she reads. Oh PJ, so very glad you've enjoyed Close To The Fire and all of the Westen series. I'll be going back there later next year. :) And Thank you for such a lovely review!! I grew up reading suspense and mystery novels. Romance novels of any sort didn't happen for me until later in life. Romantic suspense and historical romance are my two favorite sub-genres. I enjoy the Harlequin Intrigue line. They have many good authors and Debra Webb is one of my favorites. She was one of the first I discovered when I started reading romances. Another Intrigue author I enjoy is B. J. Daniels. I have traveled in several locals she features in her books and it is like being back there. I have never read Carey Baldwin, but she is one I will definitely have to check out. The same for Suzanne Ferrell. I enjoy Iris Johansen, Lisa Gardner, Julia Spencer-Fleming (who would probably de considered mystery), Linda Howard, Karen Harper, Kay Hooper, and Heather Graham. I have enjoyed Kat Martin, but have read primarily her historicals. Julie Garwood is a favorite primarily for her historicals, but her contemporaries are good , too. There are more I enjoy, but this is all I can come up with at the moment.